The Rio Olancho Direct Trade Coffee Project is an amazing success story, made possible only by the commitment and hard work of coffee producers in remote communities throughout Olancho Department. Beginning in 2009 with just six producers in the village of El Carrizal, the project now involves nearly 60 growers from a dozen communities. Prior to this project, these small-amount producers received just a fraction of the market price for their supermarket grade coffee. But with encouragement from The Carpenteros and Friends and Diaconia Nacional – an agency of the Christian Reformed Church in Honduras – these growers took a leap of faith as they focused on producing the highest quality coffee possible. Through field visits, workshops and one-on-one training provided by Diaconia Nacional and the Honduran Coffee Institute (IHCAFE), the Rio Olancho coffee producers learn how to achieve the highest quality at each stage of growing, picking, sorting and preparation of their strictly high-grown Arabica coffee. Producers are also taught to protect the delicate mountain environment. The coffee is shade grown using organic fertilizer and natural insect control methods, and the natural habit is protected for tropical and migratory birds and other wildlife. By adhering to these environmental practices and ensuring fair wages and safe working conditions for employees and pickers, Rio Olancho coffee has earned the Diaconia Nacional distinction of being Certified Ethical. Once picked, the coffee is dried and the husks are removed, and it is inspected for quality before being processed at the modern COCAOL facility in Santa Maria del Real. As part of the emphasis on quality, any defective coffee beans are removed through triple hand-sorting by experienced sorters. Finally, before being deemed export-worthy, the coffee is cupped and scored by a panel of experts, and must achieve a rating of 'excellence'. All farmers whose coffee is accepted for export receive a 30-percent premium over the current global base price, with a further premium paid for exceptionally high scoring coffee. This payment schedule was developed with input from the coffee growers, and not only rewards their hard work but also creates an incentive for achieving even higher quality. And the training continues after the harvest, as producers again meet with IHCAFE trainers to participate in a 'Cup of Excellence' competition and taste how their quality-control efforts are achieving a premium flavour. The Rio Olancho project has grown to involve 60 producers from a dozen communities who are providing 30,000 pounds of high quality coffee. And, because of the success of this project and its incentive for those who are committed to quality, more and more farmers are asking to become part of the project. The hard-working Rio Olancho coffee growers take tremendous pride in their coffee. They sincerely hope you enjoy their coffee, and they thank you for the support that allows them to provide a better future for themselves, their families and their communities. Diaconia Nacional, a Honduran partner organization which provides agricultural training in coffee producing communities in Olancho, awards the designation of 'Certified Ethical' when coffee growers "commit themselves to the highest standards of ethical conduct, respectful and fair treatment of their employees and labourers, commitment to quality, and to protecting and preserving the environment." There is no cost to the farmers to participate in the ?Certified Ethical? program. There are no brokers or middlemen in the Rio Olancho Direct Trade Coffee Project. Providing that the coffee beans meet the highest standard for quality, full payment is made directly to the coffee producer. There are no fees, commissions or administrative charges. In addition, the project provides additional funds for training events and for equipment to further improve the quality of the coffee. The Rio Olancho coffee project began with six producers from the community of El Carrizal, near San Francisco de La Paz. But the popularity of this coffee grew quickly, increasing the demand for a larger shipment to Canada. And producers in neighbouring communities also served by Diaconia Nacional were soon asking if they too could become part of the project. While the coffee producers come from several communities in rural Olancho, all of the coffee is grown on remote fields, in the Sierra de Agalta mountains of north-central Olancho. All of the coffee is strictly high-grown Arabica. And the farmers are committed to protecting the water supply, forests, birds and wildlife in the beautiful Olancho mountains. HOW MUCH ARE THE GROWERS PAID? The price of coffee changes daily. But farmers who participate in the Rio Olancho Direct Trade Coffee project are guaranteed a fair base price plus a premium to recognize their commitment to quality. The base price reflects the global market price for Honduran coffee, and is monitored through the Honduran Coffee Institute. We honour this base price so as not to cause turmoil within the local Honduran economy. 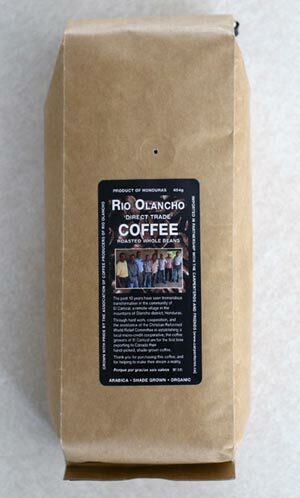 In addition, all Rio Olancho coffee is cupped and scored by experts in Honduras. Before being deemed export-worthy, coffee must achieve a certain degree of ‘excellence’. All farmers whose coffee is accepted for export are guaranteed a 30-percent over the base price, with an additional premium paid for exceptionally high scoring coffee. This payment schedule was developed by the coffee growers, and it not only rewards their hard work but it also creates an incentive for achieving even higher quality. Additional coffee producers and communities are constantly asking how they can become involved in the Rio Olancho Direct Trade Coffee project. The only way to add more communities and more producers is by spreading the word and increasing the demand for this delicious coffee. A number of Canadian partners are also buying Rio Olancho coffee in bulk. For a list of these partners, please see the ‘Where to Buy’ page. We are always looking for additional churches, businesses and individuals who want to support this endeavour.